by Brianna Crandall — August 3, 2018 — Building on the proven sound-absorbing performance and design-forward aesthetics of Rockfon’s stone wool panels for ceilings, the provider of acoustic stone wool and metallic ceiling solutions and suspension systems announced last week a new application option: Rockfon Island Wall System. Reliable, versatile and attractive, the Rockfon Island Wall System can be easily installed in nearly any commercial interior space where extra sound absorption is required. For a quick, accurate installation, Rockfon has developed an Island Wall System Kit with specialized mounting brackets to secure the different size panels at various distances. Further simplifying the process, the company has created a step-by-step photo-based installation guide and instructional video. Ideal for open-plan offices, lobbies, atriums, reception areas, banquet halls and other spacious areas, the wall system is well suited for both new construction and renovation projects in need of acoustic improvement. The tested wall panel products achieve a Noise Reduction Coefficient as high as 1.15 with a 2-9/16-inch air space. The stone wool panels’ smooth, white surface also provides high light reflectance (0.86 LR) and light diffusion. For effective, elegant interiors, the Rockfon Island Wall System may be installed at various angles and distances from the wall to produce one-of-a-kind patterns for each room. 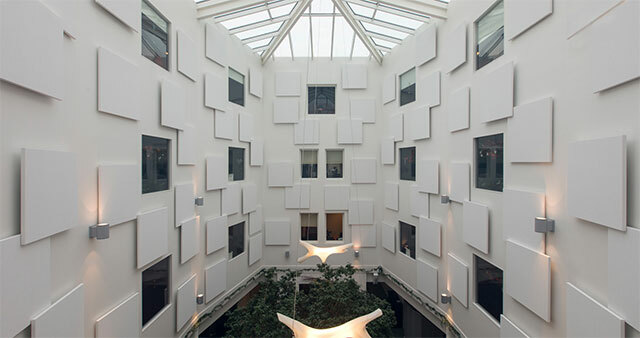 The system’s frameless, acoustic, stone-wool wall panels are offered in both square and rectangular sizes – 4 x 4 ft., 4 x 6 ft. and 4 x 8 ft. As with all the company’s stone wool products, Rockfon Island panels also are 50 to 75 percent lighter weight than other panels for easier installation. Manufactured with stone wool, Rockfon products inherently resist water, moisture, humidity and fire, as well as mold and other harmful microorganisms. Contributing to buildings’ wellness and sustainability goals, the Rockfon Island Wall System contains up to 41 percent recycled content and has earned UL Environment’s GREENGUARD Gold Certification for low-emitting products. These environmental attributes are recognized by such programs as the U.S. Green Building Council’s LEED Rating System and the Collaborative for High Performance Schools’ Criteria (CHPS). Facilities and property managers also will appreciate the acoustic wall system’s minimal maintenance and long-term durability. Rockfon Island panels are cleaned by lightly vacuuming them and are supported with our 30-year limited system warranty. At the end of their useful product life, they are fully recyclable. For more information on the Rockfon Island Wall System, see the installation video, and download the product datasheet and installation instructions. If you need flexible glass-fronted office spaces, look at Teknion’s easy-to-integrate wall system November 30, 2018 In "Products and Services » Building Products"